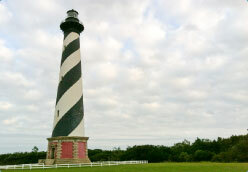 Be sure to climb the famous Cape Hatteras Lighthouse for a great view of the beaches and a pretty good workout! The Village of Buxton is located south of Avon Village and is one of the better known southern beaches of Hatteras Island. Home to the Cape Hatteras Lighthouse, America's tallest brick lighthouse at 208-feet tall, and the nationally popular fishing spot, Cape Point, Buxton is a popular vacation destination among Outer Banks vacationers. Cape Point, or Cape Hatteras, is a large sand bar that stretches out into the Atlantic Ocean farther than any other point on the Outer Banks. Surf fishing from this spot is ideal and highly sought-after, as the fish that are brought in from this spot are prized and make for good eats. The area off of the Cape has the moniker of The Graveyard of the Atlantic because roughly 3,000 ships have fallen victim to the changing tides, shifting sandbars and shallow waters that lay off of coast of the Outer Banks. More information regarding these shipwrecks can be viewed at the Graveyard of the Atlantic Museum in Hatteras Village. Buxton Village is also home to the Buxton Woods; a large expanse of maritime forest. White-tail deer call these woods home and OBX vacation rentals are nestled alongside the trees and native grasses. Just north of Buxton lies the ever-popular Canadian Hole, a popular water spot for kiteboarders and windsurfers. Located on the soundside, or west side, of Hatteras Island, Canadian Hole attracts watersport enthusiasts year-round for its strong winds and rides of a lifetime. Sun Realty is proud to represent vacation homes in Buxton Village and the properties offered by Sun Realty range from five to eight-bedrooms in this area. All of which have easy water access and impeccable water views.